Afreet is a powerful, winged creature from Arabic folklore that is related to fire. This hat gets its name from that creature. The bulky yarn puts me in the mind of a large conflagration. 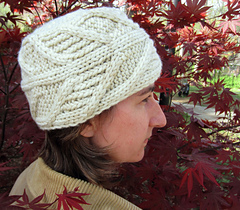 The yarn provides beautiful stitch definition for the unique cable motif. This piece matches the Afreet cowl designed as collaboration with The Verdant Gryphon for the lovely Shades of Winter 2014 collection. Details: Afreet is cast on at one end and knit in one piece. There is an option for using a provisional cast on or not. Once the knitting is complete the piece is blocked and seamed. Stitches are then picked up along the edge to knit the crown. The cable motif is a combination of 2x2 cables, ribbing, and reverse stockinette. ERRATA: If you bought the pattern prior to January 2017 please upload the newest version. There were errors in the chart that have now been corrected. Note Gauge: In order to maximize the yardage it is important not to skip swatching. The gauge is given blocked but you should not break the yarn so that you may continue knitting after the swatch is done.